The DIAPER Act lets states use child-care funds for diapers. What's so liberal about that? 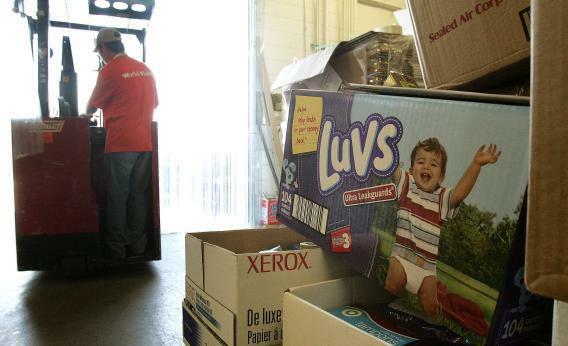 Diaper aid destined for Hurricane Katrina victims, in a World Vision warehouse September 13, 2005 in Chicago, Illinois. Rush Limbaugh is worried. Connecticut U.S. Rep. Rosa L. DeLauro has introduced the Diaper Investment and Aid to Promote Economic Recovery (DIAPER) Act, which would amend the Child Care and Development Block Grant of 1990 to allow federal funding already granted to states to subsidize child care for low-income working families to be used for diapers and diapering supplies. Most child care subsidies come in the form of vouchers that parents can give to a private provider, and most child care facilities require that parents send diapers with their children. That diaper requirement has an unexpected side effect: Families who can’t afford diapers sometimes can’t send a child to day care, even if the care itself is subsidized. One in five women reports running out of money for diapers (which can’t be bought with food stamps). That leaves stark choices: reuse a diaper, leave diapers on for longer, dry out a wet one and try to get another use out of it—or stay home. (And if you’re thinking of suggesting cloth diapers, please consider that many day-care facilities don’t accept them and that many laundromats don’t permit them, and that they have to be purchased in the first place.) Right now, there are limits on how states can use federal money granted to them under the Child Care and Development Block Grant; DeLauro wants to add “diapers and diapering supplies” to the list of acceptable uses. But Rush Limbaugh, as I said, is lathered up. His interpretation of the DIAPER Act? “Free diapers for every mother who has a kid in daycare!” According to Limbaugh, those free diapers are going to lure mothers into putting their kids into day-care centers so “we can corrupt ‘em and pollute ‘em and propagandize ‘em, indoctrinate ‘em … you can only get free diapers if you pack your kid off to government-run health care (sic).” Never mind that the nearest high-quality government-run day care without a several-year-long waiting list is in Sweden. On Limbaugh’s radar, DIAPER merits argument. I know by now you must be asking yourself–but why bother arguing with Limbaugh, of all people? The only people who who take Limbaugh seriously aren’t likely to be reading these words. Limbaugh’s willful misreading of the DIAPER Act merits argument because it’s one of the clearest examples I’ve ever seen of how hyperpartisanship is done. Limbaugh didn’t need to read the amendment to make his arguments against it—all he had to do was read the (D) next to DeLauro’s name. Because the DIAPER Act is one page of nonpartisan legislation. There are no free diapers. There isn’t even any funding for diapers. It’s a bill allowing states, from Texas to Ohio to Nevada, more leeway in deciding how to use federal funds. The funds themselves were granted as a part of the 1996 welfare reforms—a cornerstone of the Republican Contract with America, and intended to assist low-income families in obtaining child care so that parents can work or participate in education or training activities. The DIAPER Act gives states more control over spending federal money in ways intended to allow recipients of government assistance to work. Those are bedrock conservative principals. But none of that matters to Limbaugh or his ilk. “Free diapers” for welfare moms who want to dump their kids on the government pushes buttons on the party base, and pushing those buttons is more important than reading legislation or considering its impact. So far, DeLauro has had no takers for a co-sponsor of the bill on the (R) side of the aisle. Her colleagues may be more willing than Limbaugh to understand the bill, but they’re clearly afraid their constituents are more likely to be swayed by rhetoric than by logic. In Limbaugh’s world, they’re right.